Volunteering for our Meal Ministry is highly rewarding, and we welcome individuals and groups of any size to join us in serving. Dinner for unsheltered homeless persons and the working poor occurs every night of the year at 6pm, and on Sunday mornings at 8:30am in the dining room of the Towers Center of Hope at 900 W. Adams Street in Downtown Jacksonville. The line forms at 5:30pm at the gate on the Davis Street side of the building. Our Meal Ministry is staffed through volunteers from churches, civic groups, local businesses, families and individuals who want to give back to the community. We'd love to have your help! Our food pantry provides about 250 income-eligible households per week with supplemental groceries. 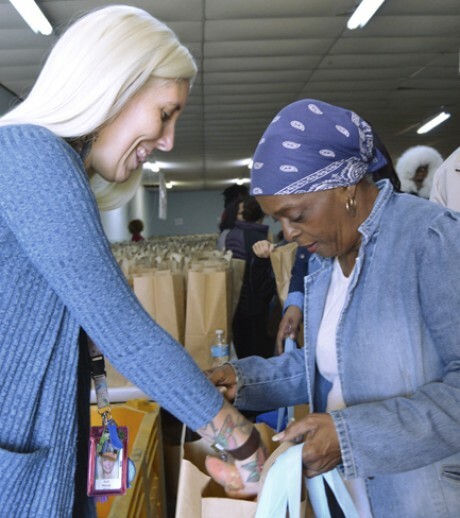 It operates out of the warehouse of our Social Services building at 140 N. Davis Street in downtown Jacksonville (adjacent to the Towers Center of Hope), and is open Monday through Friday from 9am - noon, subject to food supply. If you are living with family/friends and you are not on the lease, you must present a letter from the person on the lease that states they allow you to live with them (include the address) and bring the lease with their name on it.